LAKE Macquarie's premier rock music event LAKE MACQUARIE ROCKS will be launched this Saturday night by THE SACRED HEARTS at Belmont Sportsmans Club. The Sacred Hearts will preside over the 'official opening' in the middle of a rock'n'roll dance competition, on the second night of the three-day event, after ROCK CAT ROCK performs at the club on Friday night. Saturday is when most of the events will take place, including a classic car and motorcycle cruise from Belmont to Newcastle and back, via Swansea, which leaves on Saturday at 3pm (10am registration). 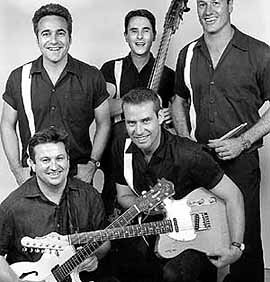 Lead vocalist PAUL FIELDS says The Sacred Hearts' brand of 1950s style rock'n'roll and rockabilly music will be right up the alley of those planning to twist and twirl the night away. 'Our audiences come specifically to dance,' said Fields, whose brother ANTHONY FIELDS is a member of THE WIGGLES and a former CLEO BACHELOR OF THE YEAR. Sharing his brother's good looks and perky personality, Fields is an upbeat front man, whose enthusiasm for rock'n'roll music is infectious. The band's fourth CD COOL ROCKIN' DADDIES features the children of the band's five members dressed up as their dads, but this is no kid's record. Rather the album is a 'fusion of rock'n'roll and other related music, which also features 'a horn section to really punch out the 1950s style of music'. It also features cameos performances by members of The Wiggles who, along with Paul, his brother guitarist JOHN FIELD and guitarist JEFF MORRISON, used to perform in 1980s chart toppers THE COCKROACHES. (Trivia alert: John Field, Sacred Hearts guitarist, wrote one of The Wiggles biggest hits HOT POTATO!) Don't expect any kid stuff on Saturday night, but who knows, John may be persuaded to sign Wiggles CD covers or video sleeves!